Although single-incision laparoscopic surgery (SILS) cholecystectomy using multiple rigid or articulating instruments through a single port results in improved cosmesis compared with the traditional, 4-port laparoscopic cholecystectomy technique, limitations of the procedure include decreased freedom of motion, lack of triangulation, suboptimal exposure and visualization of Calot’s triangle, and difficulty maintaining pneumoperitoneum. A new SILS platform, the TransEnterix SPIDER, consists of a multiple-channel device that enables flexible laparoscopy, facilitates triangulation, and minimizes tissue trauma. The use of the SPIDER single-port system has not previously been described in a series of patients. In this single-institution, prospective, unblinded case series, a consecutive cohort of patients with an indication for cholecystectomy presenting to the author’s service, whether scheduled or emergent, underwent SPIDER cholecystectomy. Four patients were excluded from the consecutive series. Exclusion criteria were high cardiac risk (n=3) and sepsis (n=1). Standard surgical clips were used to ligate both the cystic duct and the cystic artery. A total of 50 patients (14 men, 36 women; mean age 48.34 y) underwent laparoscopic cholecystectomy utilizing the SPIDER system for a variety of diagnoses, primarily chronic cholecystitis with cholelithiasis. No major adverse events occurred. Selective intraoperative cholangiography was performed in 6 cases via a separate puncture technique. The procedure was successfully completed in 48 patients (96%), with 6 patient(s) requiring 1 additional trocar. Two cases (4%) were aborted: 1 due to mechanical malfunction of the device, and 1 due to severe inflammation and sclerosis. All aborted cases defaulted to a standard 4-port technique. No patient required conversion to an open cholecystectomy. 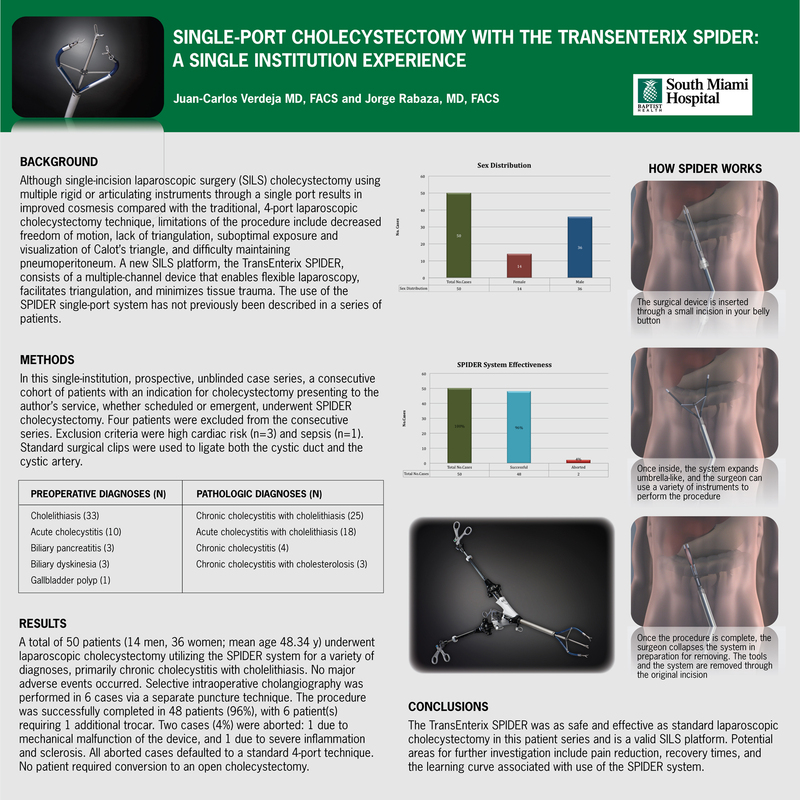 The TransEnterix SPIDER was as safe and effective as standard laparoscopic cholecystectomy in this patient series and is a valid SILS platform. Potential areas for further investigation include pain reduction, recovery times, and the learning curve associated with use of the SPIDER system.